The front porch is screened and has four comfy chairs -- two wicker and two bamboo. Before we had the breakfast room, it was often where I started spring and summer days with coffee and the paper. On some afternoons, it is where I choose to have a cup (or glass) of tea and a sweet. I have coveted the tray that Ina Garten uses on her Barefoot Contessa show. It's big (holds at least two dinner plates plus), has an acrylic bottom (for spills) and two leather handles. Inquiries as to where to purchase the tray indicated that the tray is an old purchase, the tray is no longer available, and if the store where she purchased it were to restock the tray would be around $300. Too pricey for my purse! But last week I was at a Pottery Barn and came across this tray -- at only $59 but the bottom was wicker. A trip to our local glass shop and for $9, I had a piece of acrylic cut for the bottom! It's not Ina's tray but it's a good knockoff and my purse isn't as light as it would have been had I bought Ina's real tray! Even though out weather has been almost perfect, it is still March and not yet Spring and so my wee pot holds tea. I am normally a leaf person but, alas, I was out of my favorite, Earl Grey, and the only Earl Grey at our market comes in a bag. 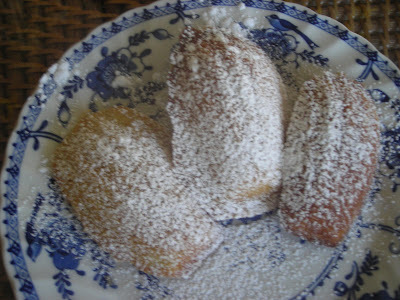 The perfect snack for a cup of tea after an afternoon working in the front garden are madeleines. I have my favorite recipe that I've been making for years. But I found a new recipe in Dorie Greenspan's, Baking From My Home to Yours, that had Earl Grey tea in the batter. What could be better than two favorites rolled into one! They were quite good and you could actually taste the Earl Grey in the cookie. I won't forsake my old recipe for this new one but I will make the Earl Grey version from time to time. The perfect tea for this cookie -- Earl Grey, of course! Mix together the sugar and lemon zest with your fingers. Whisk together the eggs, sugar and zest until thickened (2 to 3 min). Add the honey and vanilla extract and whisk for another minute. Preheat the oven to 400. Butter and flour a madeleine pan. Distribute the batter equally between the 12 molds. Bake for 9 minutes and check. Bake until the tops are firm to the touch, up to 14 minutes. Remove from the molds by tapping the pan. Dust with powdered sugar. I have to figure out what I don't like about this post. 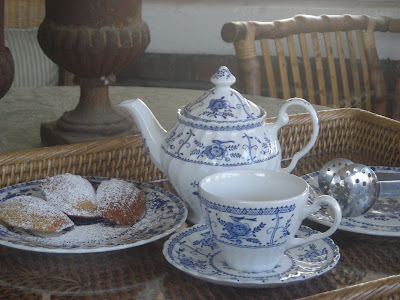 I love your blue china, I love Ina, I love the wicker tray and I love your recipe for madelines. I'll have to study this firther. well, my plain cup of coffee certainly looks shabby after seeing that! What gorgeous blue china. Your porch is so inviting. Thanks for sharing and for visiting my blog Life At Home. It is so nice to meet you. Aren't you the clever one coming up with your own version of Ina's tray! 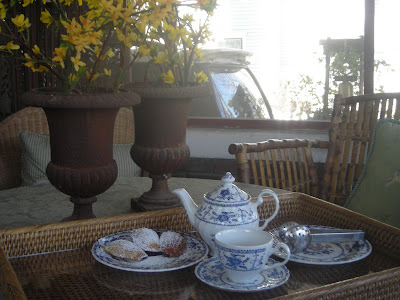 I love the blue china and the thought of tea on the porch on a warm day sounds like heaven right now! Earl Grey is my favorite tea. The madelines sound delicious. I'm going to have to try yet another one of your recipes. By the way, I ordered an Anna Pump cookbook thanks to you Ms. Martha! Can't wait to get my mittens on it! Glad you found a serving tray...that's always so exciting when something good like that happens! 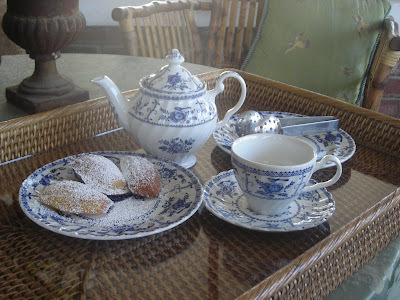 Aaaahhh...I love Earl Grey and Madeleines....one of my favorite afternoon treats! Your tray recreation is perfect!!! Ah -- you have the Indies tea pot! I don't have that one -- just the sugar bowl and creamer in the Indies. If you want loose "Earl Grey," email me and let me know -- I would be happy to send you a tin!